The creative process is often described as cyclical, and sometimes, when I’m in it, I feel like I am going around in circles, ending up where I started. I always hope that when I come back around in that circular process, my ideas have evolved so that even though I may be in a familiar place, I am truly somewhere new. Perhaps the creative process is more like a spiral, repetitious yet constantly moving forward. This concept not only illustrates an important artistic process that we want to share with visitors to the Center for Creative Connections (C3) but also describes the methods we employ as our space evolves. The creative process is an inspirational component of C3, and it is exemplified through the Art Spot, a hands-on art-making area. In 2008, the hands-on art-making area within the C3 exhibition Materials and Meanings was called the Materials Bar, which provided a hands-on experience of the creative process, engaging visitors with an inspiration wheel, videos that modeled techniques, materials that encouraged play, and a reflective label writing component. In 2010, C3 presented its second exhibition, Encountering Space, which involved a complete redesign of the entire C3 and transformed the Materials Bar into the Space Bar, which included prompts for the hands-on art-making experience. 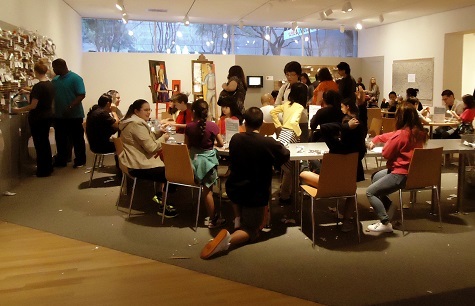 In 2012, the hands-on area was renamed the Art Spot: Anytime art-making for everyone, and it focuses on rotating works in the C3 galleries or the idea of creativity. For me, the creative process can be simplified to four steps: inspiration, exploration, creation, and reflection. With each iteration of the making area in C3, we come full circle. We start with an idea—a theme like materials, space, creativity, or a work of art; next we explore the possibilities of that idea and play with what it might look like; then we construct it for visitors to experience; and finally we reflect on the actual visitor experience. Over the years, the various iterations are in many ways similar, but with each new endeavor we learn and revise. In the past, we strived to inspire participants with the art on view in C3, though we found this can be difficult when the works of art are not directly adjacent to the making area. In the upcoming redesign, we are installing more works of art in the Art Spot and are strategically placing them near the tables where participants will be creating. The cases housing these works will have prompts directly on the glass to provoke thought and discussion about the materials, design, and process. These kinds of prompts can help visitors get into the making mindset, a way of critically looking at and exploring materials. Also, our approach to choosing works of art has shifted. In the past, we chose works of art that exemplified a concept and might inspire visitors to create. This time we are taking our inspiration from our visitors. Over the past few years, we have documented the kinds of creations made at the Art Spot. We know that regardless of the theme or materials, there are common items that are made: rings, animals, flowers, hats, and woven objects. So we started with those observations and chose works of art, such as those featured below, that visitors might more easily relate to and that had some evidence of both the materials and the method of making. Finally, we will continue to encourage the creation of three-dimensional objects, but rather than having one set of materials, we will offer different materials at different stations that relate to the nearby works of art. This will offer some variety and give visitors more options. When the Art Spot reopens next week, we will continue to ask for visitor input, because being an experimental space means that we are constantly evolving through the creative process. We will document the creations visitors make, read the reflective statements they write, talk with them about the works of art, the materials, their creations, and their overall experience to get a sense of what aspects of the new design are working and what we might revise. Stop by the Center for Creative Connections this summer to see the redesigned Art Spot, be inspired by the newly installed works of art, make a creation, and give us your feedback! Jessica Fuentes is the Center for Creative Connections Gallery Manager at the DMA.